For those of you who come solely for the food, these healthy-ish cranberry date muffins are perfect to add to any holiday brunch. They have a good dose of eggnog, a spot of rum and toasted hazelnuts atop. They are sweetened with molasses and spiced with cinnamon and cardamom. Doesn’t that just sound like the epitome of a holiday muffin? And they could just about turn anyone’s pessimistic attitude about “healthy muffins” into blissful surprise. Every time I’m at the gym, I see one particularly upbeat and friendly lady there. She is about 75 if I were to guess, is fitter than I have ever been (think female Jack LaLanne), and I don’t believe I have EVER seen her without a genuine smile broadly spread across her face. She always has something nice to say. For those of you who know me well, I’m a bit of a skeptic. I really would appreciate you controlling the burst of laughter when I wrote “bit”. I tend to see all the strange little things going wrong in my life and add them up instead of focusing on all the big, beautiful things going exactly right. So when I got to talking with said positive gym lady, I decided to up my game and try to match her enthusiasm for life as we gabbed about Thanksgiving dinners with our families, holiday shopping and guests coming over in the next few weeks. 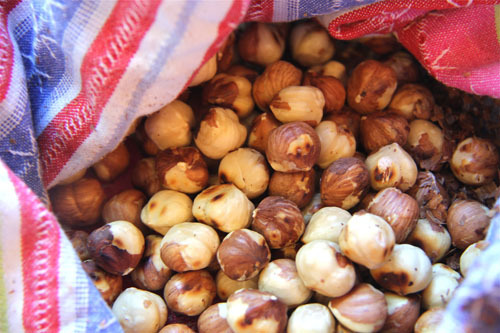 To shell the hazelnuts, toast them and then bunch them together in a clean kitchen towel, gently rubbing off the shells. Just as I expected, everything she said had a silver lining. Her son and daughter-in-law live far away, “BUT THEY’RE COMING FOR CHRISTMAS!“, she said excitedly. Her giant Santa Mickey Mouse lawn decoration that she loves so dearly has finally (after 10 years) burst a hole, but she FOUND ONE ON EBAY! Well, actually two on Ebay and she bought them both. Seeing my puzzled expression, she explained that she would use one right away and one when the next one burst a hole in another ten years or so. Now if assuming one will be needing another Mickey decoration at 85 yrs. old isn’t optimism at its finest, then I don’t know what is. She then asked me questions about my holiday plans and in true Geni style I started to tell her that my kitchen floors were still not done and that I have been without my kitchen now for about eight long and suffering weeks while my oven is sitting, very lonely-like and morose in the front entry way. The poor woman did not deserve to be an audience to my string of complaints so i feigned optimism, but then, out of nowhere I honestly felt a weight taken off my shoulders and stress floating out of my body. It turns out that maybe optimism is catchy and perhaps I caught a bit of her happy bug for the time being. I am going to see how far I can take it and try to look for all the silver linings—for example dieting at the holidays really isn’t SO bad when you have muffins like this for breakfast! 1 c. fresh cranberries, rinsed and patted dry. To make the muffins: Preheat your oven to 375 degrees Fahrenheit. Line a muffin pan with muffin cups. In a large mixing bowl, combine flours through salt and whisk together. In a medium-sized mixing bowl beat together the eggnog through rum. Pour 1/2 of the liquid ingredients into the dry and combine with a rubber spatula. Then add the rest of the liquid ingredients and combine until just mixed together. In a small bowl, toss the cranberies and chopped dates with 1-2 T. flour to coat them. This helps disperse them in the batter and stops them from sinking to the bottom of the muffins when they bake. Stir in the cranberries and dates into the batter. Toast your nuts on top of the stove in a small saute pan. Turn the burner on medium heat and keep tossing the nuts around. Never leave them alone. They will burn quickly. Once they smell toasted, they are…about 1-2 minutes. To shell the nuts, simply put them in a clean kitchen towel in the center. Wrap the towel over them as in the photo above (towards top of post) and rub them together. The shells will fall off. Do this while they are still warm, once they cool it doesn’t work. Chop your hazelnuts and set aside. Scoop, using a medium-sized icecream scoop, into your muffin cups, filling them 2/3 full. Top each filled muffin cup with a pinch of Turbinado sugar and a sprinkling of hazelnuts. Bake for 15-20 minutes or until slightly firm to the touch and toothpick is clean when inserted. Feel free to serve warm with coffee and a touch of eggnog. Categories: Bread | Tags: cranberry muffins, date and eggnog muffins, healthy cranberry muffins, healthy holiday brunch recipes, healthy muffins, holiday brunch recipes | Permalink. I am loving this festive muffin!!! Those look so festive and beautiful! Your gym lady sounds fantastic! She must be so well liked and loved. It’s not always easy seeing the glass as half full but it certainly does help to see it that way. Fantastic muffins! Perfect for the holidays and every other day of the year too. I come here for the food and your sparkling personality Ms. Geni. Thanks for the reminder that I need to shoot my dart gun at my neighbor’s inflatables again tonight. Kidding. Katherine and I joke about the neighborhood’s light display. So many inflatables, and those moving deer. We have penguins, a Saint Bernard, Santas. Our one dog barks at them if they move though. Lowfat eggnog hey, well OK then. I need some anyway. Oh and the hazelnuts, great recipe! I’m postively loving these muffins! I am like your gym friend – that’s positive – not 75! I do chat away at all the good in my life…and that’s because I refuse to complain! It’s a learned behavior and it also makes me feel good too! Now you listen here, Missy, it’s one thing to torment people with sweet muffins studded with fruit and nuts, but it moves to another level of cruelty entirely when you mention that they’re also spiked with eggnog and rum. Have you no mercy?? Oh, the huMANity! 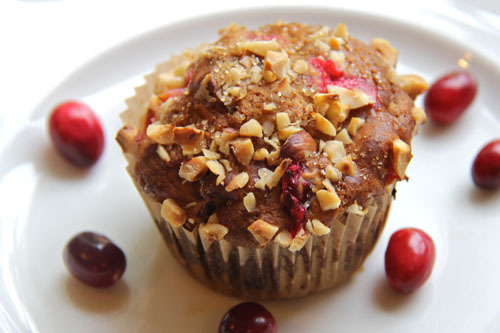 I just love eating cranberries, so these Cranberry Muffin will be a welcome addition inside my home. My mother will just love this recipe. Those look and sound yummy …. Great post Geni–we all need someone like that in our lives, don’t we? What a special lady to know — and I’m speaking of you, Geni! You’re far too hard on yourself. 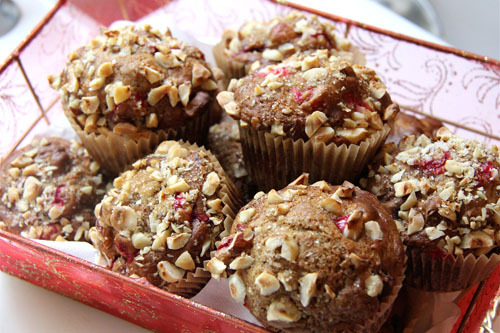 Anyone who brings these great holiday muffins to the World is aces in my book! I love the nutty topping! Nothing says optimism like spiked muffins! 🙂 These muffins look gorgeous with the color of the cranberries and the perfect sprinkling of nuts on top. A perfect start to the day! I enjoyed this post so much. Optimism really is contagious. I hope I am half that happy at 75! I love the way that looking for the silver lining actually makes everything look better in that light. And for the record, eating lighter through the holidays really isn’t that bad. Not fitting into your clothes in the spring IS that bad! These muffins sound delicious, not at all like health food. Have a fabulous day, Geni! I rather like your balance of skepticism and optimism. I think it makes for a good read with the honestly shining trhough, though this time of year I’m all for the happy-jolly. What a neat lady, you’ve met. And I’m optimistic those HEALTHY muffins will be de-li-cious. 🙂 And that your floors will be done very, very, very soon. Hugs! Yes! Epitome of the perfect holiday muffin indeed. I can imagine how delicious these must have tasted when fresh out of the oven. I love that the conversation took a turn for the better. Sounds like you met a lovely woman. 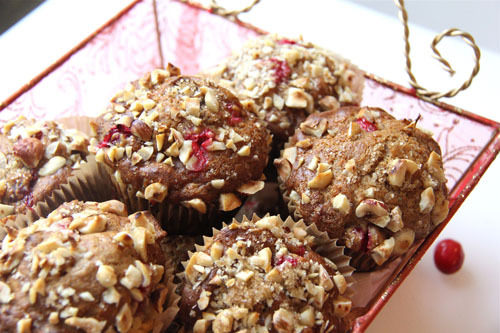 Dieting during the holidays definitely isn’t as bad if you’re allowed to eat these muffins! Yum yum yum. Not only does it sound like the ultimate holiday muffin but adding in the rum just brings it to a whole new level for a muffin. It sounds perfect! Hazelnuts, cranberries and rum. Yum! The perfect make ahead holiday breakfast idea. The muffins are a perfect way to start the day. Tasted wonderful! optimism is catchy. have a great day. Love all the unique flavors combined in the muffins! They look beautifully domed, just like perfect muffins should be!